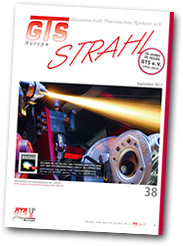 In the new issue of GTS-Strahl we again report on news and activities from within the association and, of course, again offer interesting technical articles and reports on GTS members and thermal spraying. Together we can get ahead, everyone can contribute! You will find further topics and interesting technical articles from science and industry in the “Thermal Spray Bulletin” section of the journal. Just go to the journal’s homepage at www.thermal-spray-bulletin.info. Click on "Get Acrobat Reader" to download the latest version of Acrobat Reader. This is a link to an external site! Last updated: 07.09.18 Home Copyright (C) 2013 GTS e.V.